Mochi is probably one of my most favorite things to eat. I prefer my mochi plain and fried with just a little bit of soy sauce. Yum! But when it comes to dessert mochi… I’ve never really been a fan of azuki (red) bean filled mochi. It’s ok… but I like the taste and texture of the mochi itself, and to me, the red bean just gets in the way. Someone mentioned Hawaiian Butter Mochi to me a few weeks ago. I’ve never had it before, but it sounded delicious. I still had some fresh grated coconut leftover from a coconut cake that I made… so I thought it would be a perfect time to try the recipe out. The recipe I found called for evaporated milk + water… I had some in the pantry, so I used it. But – evaporated milk is just shelf-stable concentrated (canned) milk. Instead of using evaporated milk + water, you could substitute with an equal volume (about 2 cups) of regular milk. Mochiko (sweet rice flour, a.k.a. glutinous rice flour) can be found on the international food aisle of most regular grocery stores, or in a Japanese or Asian market. I always buy the Koda Farms brand, with the blue star on the box. 2. Mix the melted butter with the sugar and salt. 3. Add the vanilla, and one egg at a time. 4. 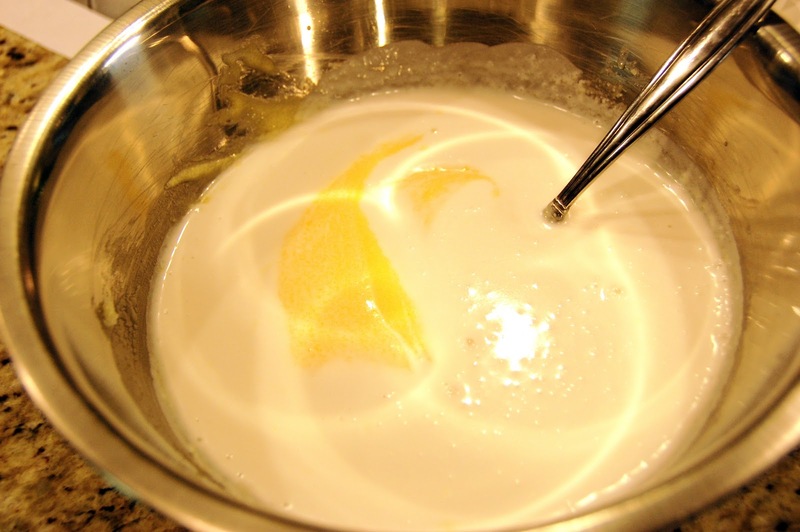 Mix the coconut milk, evaporated milk, and water into the sugar mixture. 5. 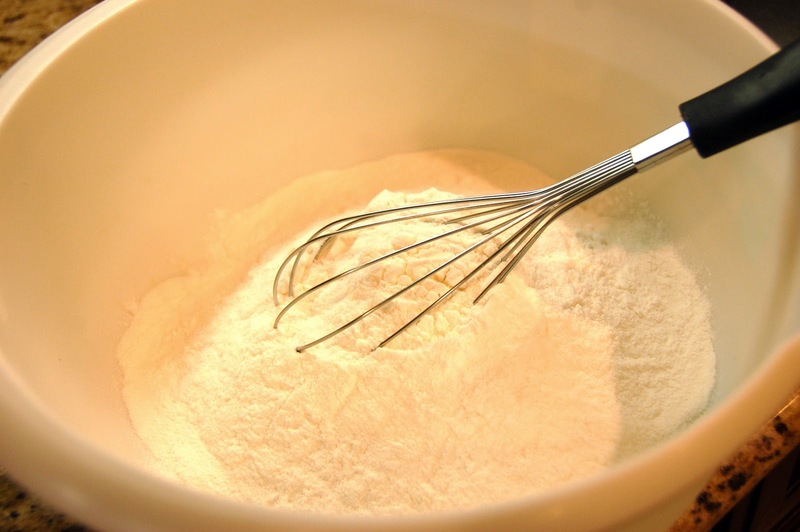 Whisk the mochiko with the baking powder to sift. 6. 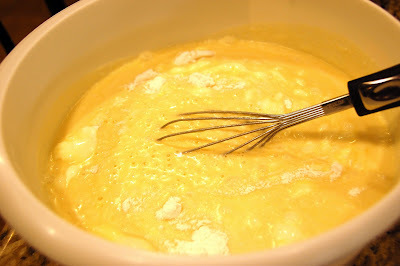 Pour the wet ingredients into the mochiko mixture and whisk until smooth. 7. Pour the batter into a greased foil lined 9 X 13 inch baking dish. 8. Bake at 350 degrees for 50 minutes. 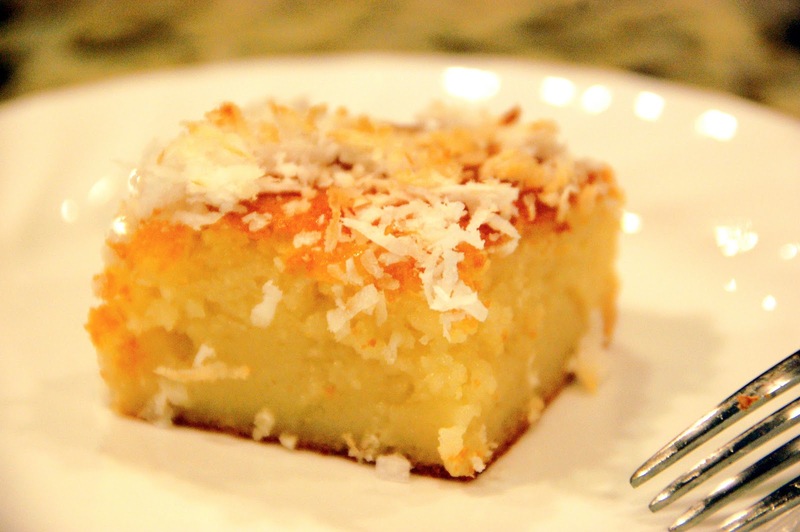 Then, sprinkle the top with the grated coconut, and bake for 10 more minutes. 9. Remove and cool. Cut the butter mochi into squares when cool. Place the squares in cupcake liners on a platter to serve.